I’m about to risk another of my blanket statements --- in fact, I’ll make two. First --- Vincent Sherman was the last major surviving director who had worked in the 1930’s. 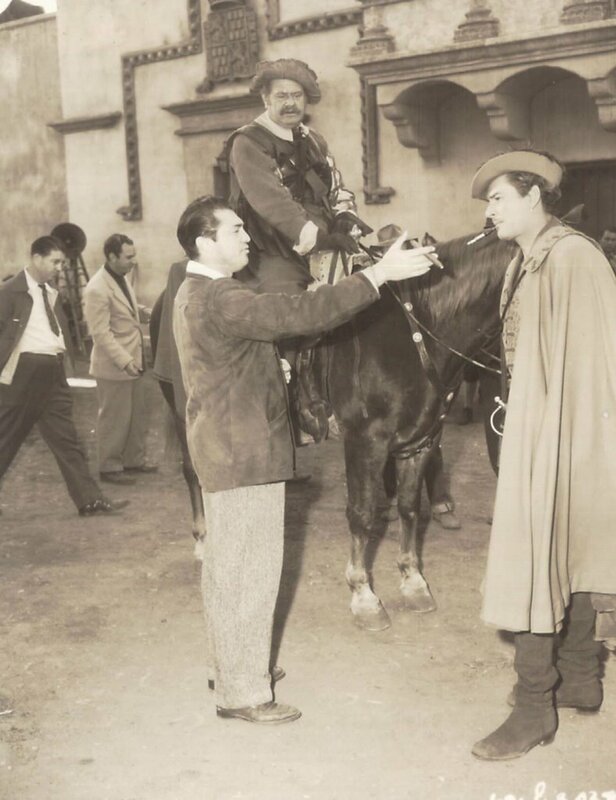 Second --- he was the only director from the thirties to participate in DVD extras. Right or wrong? I realize that Sherman helmed only one actual thirties release --- The Return Of Dr. X --- but still I’d maintain --- he was the last of them. Another four or so weeks and he’d have made it to 100 --- and sharp as a tack for all of that. There are Vincent Sherman audio commentaries we haven’t heard yet. Some of them are forthcoming on DVD --- The Hasty Heart, Return Of Dr. X, All Through The Night. I understand he recorded tracks for all of the Warner pictures he did, so his legacy will live on, as if the films and his incredible book (Studio Affairs) weren’t enough. This was a truly amazing man. He was making personal appearances right up to the end. Vincent Sherman was one Hollywood veteran you believed. There was a genuine modesty about him. Flamboyant types like Raoul Walsh and William Wellman back in the seventies were chock full of colorful insider tales, and tall ones at that --- these old-timers were no doubt trying to live up to countercultural expectations by presenting themselves as rebels against the system --- always getting the last word on studio bosses, forever pulling a producer’s bacon out of the fire. Vincent Sherman would never descend to such caricature. He was never hostile like John Ford. He didn’t fabricate like Howard Hawks (love ya, Howard, but you sure told some whoppers!). Mr. Sherman just sat back and calmly told it as it was. That book he wrote is hands down the best director memoir I’ve ever read. If you haven’t checked out Studio Affairs, HERE is where to get one. I challenge you to put it down once you've started. The last Courts autograph show I attended was in 2001. They used to be held at the Beverly Garland Holiday Inn in North Hollywood. Some of the dealers and celebrities would get there early in the morning. On this particular Saturday, I came directly from breakfast to the ballroom. It was a more or less vacant 7:00 a.m. --- except for a hale and hearty gentleman in his nineties seated at the far end of the room, clad in a turtleneck sweater and sport jacket --- all by himself. He’d probably been up for hours. Guys in their nineties don’t sleep late (unfortunately, neither do guys in their fifties). I walked up tentatively to this man who’d acted with Barrymore, directed Bogart, Flynn, Davis, Crawford, and Gable --- and introduced myself. Vincent Sherman invited me to sit down and talk. For twenty minutes, we did. I can’t remember one thing he said. I just kept pondering the fact that I was sitting at a table talking to the director of The Adventures Of Don Juan … and All Through The Night … and Mr. Skeffington … and …. Let’s just say this experience had it all over the time I spoke with Val Kilmer at the Virgin Megastore on Sunset --- and for the record, Vincent Sherman was about the nicest celebrity I ever met (take that, Adam West!). These stills attempt to hit some highlights in a career filled with same. 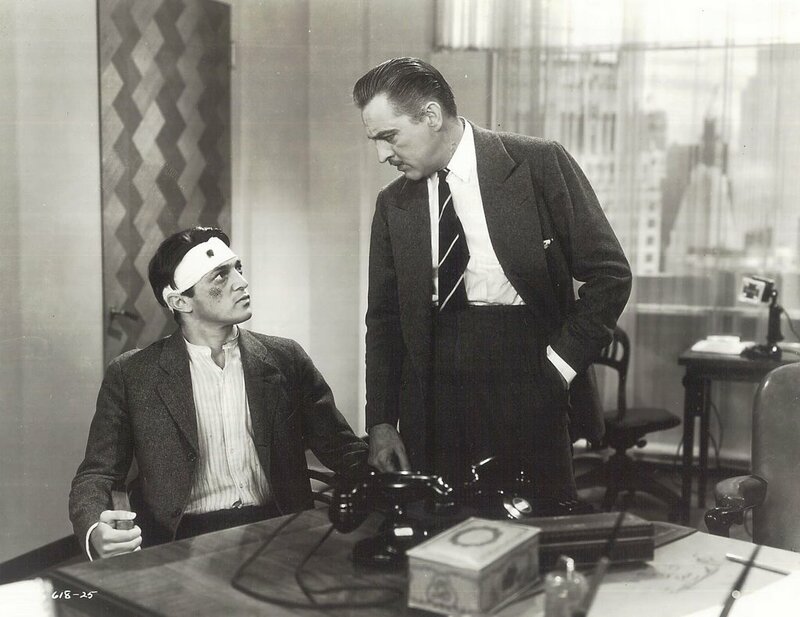 Counselor-At-Law saw fledgling actor Vincent Sherman (actually, he’d clocked several years on stage by that time) standing up to at-his-best John Barrymore in 1933. Read Studio Affairs for an amazing account of that experience. Sherman wrote insightfully of his working relationship with the great Claude Rains in the 1978 essay collection, Close-Ups, edited by Danny Peary (another fantastic book). 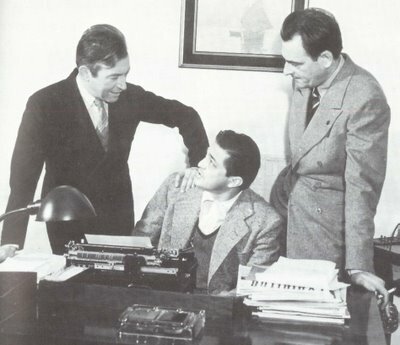 Here they are in 1940 working on Saturday’s Children. Director John Huston’s just been called off to war, so he’s turning over Across The Pacific reins to Sherman, as co-stars Bogart, Mary Astor, and Sydney Greenstreet look on (guess we can applaud them both for the great movie that turned out to be). The Hard Way was embraced by feminists years after the fact. Speaking of the ladies, Sherman had a way with them. 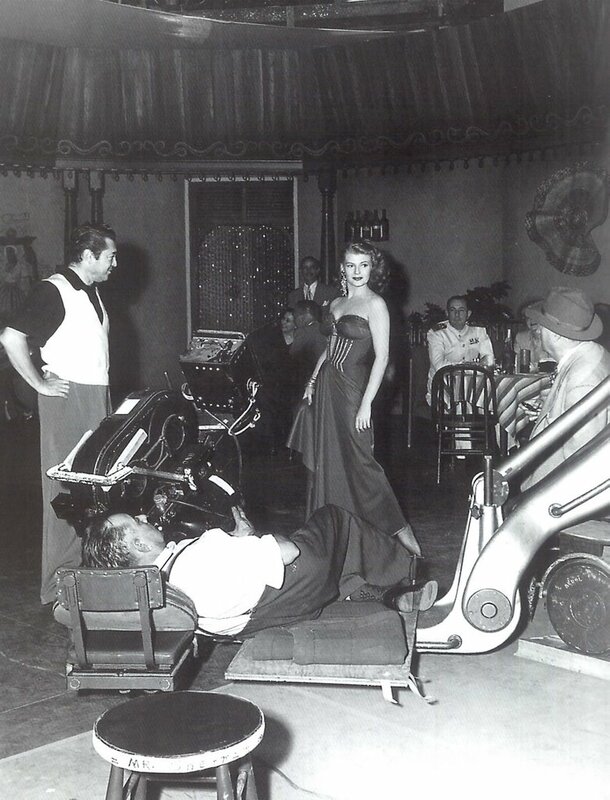 Those Studio Affairs included Davis, Crawford, and Rita Hayworth. The chapters on them are among the most revealing in his book. 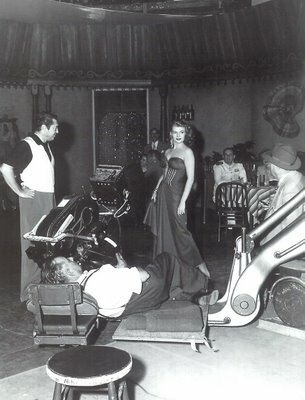 This set still with Hayworth was taken during Affair In Trinidad (1952). 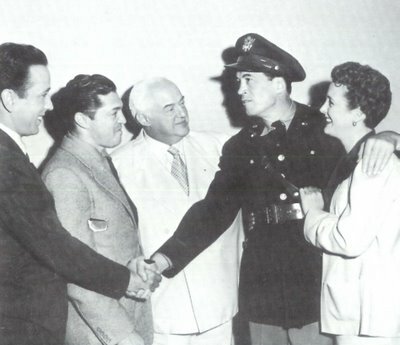 Errol Flynn gave rise to any number of Sherman anecdotes, all of them priceless. Here they are with Alan Hale on The Adventures Of Don Juan. 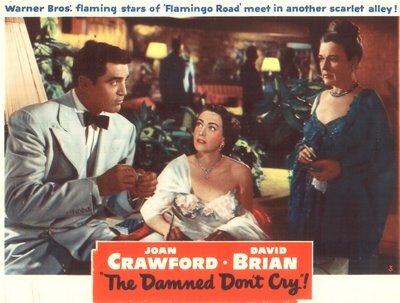 The Joan Crawford melodramas at Warners were best when they dealt with noir and crime themes --- The Damned Don’t Cry was Vincent Sherman’s contribution --- and a fine one. 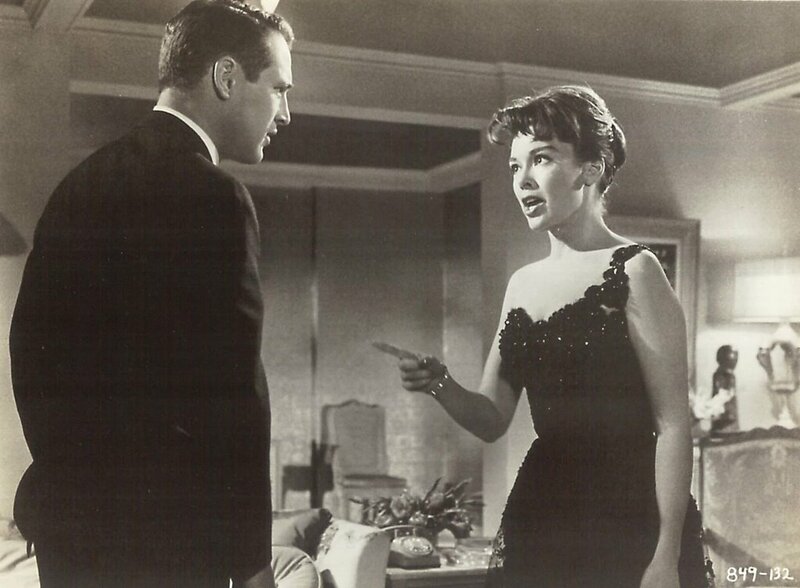 Finally, there is The Young Philadelphians, a criminally underrated Warners release from 1959 (that's Barbara Rush with Paul Newman). Can’t wait for that DVD. Vincent Sherman retired in 1983 with some episodes of Trapper John, MD. Truly one of the most versatile directors around. I never saw a bad picture with his name on it. He was our last great ambassador for classic Hollywood and he will be sorely missed. I think THE HARD WAY is a first rate vehicle for Lupino; it's my favorite of Sherman's pictures. I always look at THE HASTY HEART when it turns up on TCM. It isn't perfect, but Sherman and lead Richard Todd managed to capture something unique about dying and loneliness... It's moving in a way hard to find in other studio productions. I sent Joan Leslie a 1942 copy of Life magazine, upon the cover of which she danced in one of her costumes from "The Hard Way." The article inside mentioned her impending appearance in one of my all-time favorites, "The Sky's the Limit" (at that time it was planned under the title "Look Out Below.") In a letter I told her how much I enjoyed her performances in "Sky's" and other movies, and she signed the cover, "This was the high point of my career," and sent it back to me. It wasn't clear to me whether she meant "The Hard Way" or "Sky's," but I certainly treasure it either way.